Break out the banjos and get set for a big old barn dance! 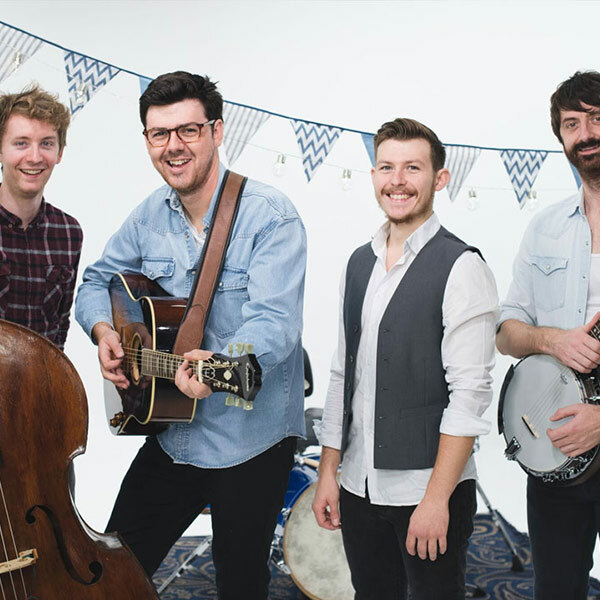 Our Live Music Band, Jubilee, are here to bring their roots-driven, Mumford & Sons style sound to all of your favourite hit tunes. A fun-filled, unforgettable addition to your festival themed wedding or high-end corporate function. Jubilee are one of the UK’s most popular live music bands for the festival-themed wedding, and it really isn’t hard to see why. They take their incredible musical talent and use it to sculpt two sets of captivating live music: The first takes a stunning selection of songs spanning four decades and offers them up with a whole new Folk driven spin; complete with banjo, double bass and soaring vocal harmony. For the second set, they go hard and loud with a blistering indie-rock set filled with your favourite festival tunes. All that’s left for you to do is dance into the early hours!